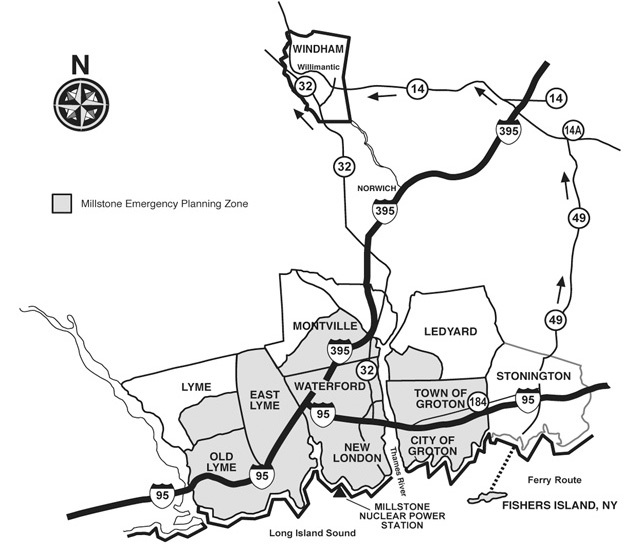 Evacuation Routes – Fishers Island Utility Co. Bus transportation will be provided to Windham Reception Center. Take Right onto Pequot Trail from N. Main St.
Continue North where road changes to Taugwonk Rd. Continue North on Taugwonk Rd. to Rt. 183 East (New London Turnpike). Take Left onto Rt. 49 North. Continue on Rt. 49 (by taking a Left turn at intersection with Rt. 216 and turning Right at intersection with Rt. 165, through stop sign). Rt 49 makes Left onto Rt. 14A West which turns into Rt. 14 in Canterbury. Follow Rt. 14 to Rt. 66. Turn Left onto Rt. 66 South (Main St.). See directions from Main St. to Reception Center, Windham High School. Take Rt. 32 North to Windham (Willimantic) to Rt. 66. Stay straight on Jackson St.
Take Left onto Valley Street. Take Right onto High Street to Windham High School. Follow Main St. past Town Hall. Take next Right onto Windham Street and continue Two blocks. Turn Right onto Prospect St. and continue one block. The Reception Center is Windham High School on High Street across from ECSU.